Over the last few years, as manufacturers and researchers around the world have taken digital x-ray detectors out of the lab and into clinical trials, it's become clear that digital x-ray imaging will indeed revolutionize diagnostic radiology. In fact, many observers have hailed it as the most significant breakthrough in x-ray imaging in the last 25 years, referring to it as "the New Modality." No matter how large or small your facility may be, it's time to start giving serious consideration to how digital detection will impact your department and which technology will meet your needs most thoroughly and cost-efficiently. This tutorial introduces the key concepts around Digital X-ray technology and analyzes its impact and potential benefits. 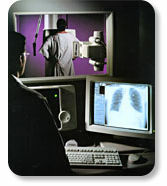 To understand the potential significance of digital detectors, consider what happens to the x-rays collected by even a state-of-the-art conventional x-ray device, such as a radiography & fluoroscopy system equipped with a digital box: The x-ray signal is transmitted from the tube, through the patient, and into an image intensifier. Next, the signal is processed through image-intensifier and camera optics before being sent on to a video camera and through digitization (Fig. 1a). Finally, the remaining signal is sent on for display and hard-copy generation. Note that at each stage in this process, the x-ray signal is degraded to some extent, even if the individual components are optimized for the application. As a result, typically less than 40% of the original image information is available for use in image production. Now consider what happens when we add a digital detector to the equation: It replaces everything but the x-ray tube and patient (Fig. 1b)! Because of its high Detective Quantum Efficiency (DQE), it has the potential to capture over 80% of the original image information. And it equips the user with a wide range of post-processing tools to further improve that signal ' including many that can be applied automatically. In a conventional, digitized R&F imaging chain, the signal degradation that occurs with each component consumes more than 60% of the original x-ray signal. A digital detector replaces all these components, allowing the user to preserve more than 80% of the original signal ' and to further enhance that signal automatically or explicitly. What's more, these advantages are applicable to the full range of x-ray imaging modalities, including chest and breast imaging, and in the future fluoro-based applications. The result? Far more accurate and detailed renderings of the anatomy of interest ' and a wealth of opportunity for further enhancing the diagnostic utility of each and every exam you conduct. As already reported by some sites, it won't be much longer before capabilities such as these become available to all Radiology departments around the world. Some of digital-detector technology's most obvious potential advantages fall into the clinical realm. For example, digital imaging is already proving its ability to enhance both radiographic and fluoroscopic image quality by improving latitude, DQE and contrast resolution (Fig. 2). It's permitting further improvements in the diagnostic utility of virtually any study through advanced image post-processing techniques. And it has the potential for lowering patient radiation dose, not only during the initial exam, but also by minimizing the need for retakes. The result: improved diagnostic confidence for a full range of applications. Over time, departments using Digital-detector technology stand to realize substantial financial rewards. Operating costs should decrease because of dwindling requirements for film, processing equipment, chemicals, and archiving space ' not to mention the labor now required for managing these activities. Thanks to the inherent speed of digital exams, increased patient throughput should drive up revenues for facilities with adequate patient volume ' or, alternatively, allow reductions in the number of rooms and their associated costs. Properly engineered digital detectors may pave the way for a broad range of future advanced applications, such as Computer Aided Detection and teleradiology, to permit cost-cutting consolidation of resources. 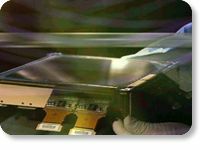 Conventional x-ray systems rely on phosphor/film or image intensifier/pickup-tube techniques to create analog images. Digital technology simplifies this process, using a single detector to create direct digital images. In conventional radiography and mammography systems, images are created using a phosphor/film combination; with fluoroscopy, an image intensifier and TV pickup tube are used to capture images in real-time. In both cases, the images are "analog", and the signals are highly susceptible to noise and degradation ' much as an LP record can skip if it's contaminated with dust or dirt. With digital technology, on the other hand, x-ray signals are converted into digital images at the detector itself, with the images digitized into a matrix of pixels with each pixel coded digitally (Fig. 4). Once acquired, the image is not at all susceptible to noise. It's analogous to the compact disks on which we now listen to music. And that's true whatever approach an individual manufacturer may take to digital imaging. But if we take a closer look at various approaches, we can see that the technologies under development today have important differences. With these criteria in mind, GE scientists have been working with to develop what GE believes is the gold standard for digital-detector technology. The GE Medical Systems digital detector is the result of a collaboration between GEMS, some of the world's leading clinicians and the GE Corporate Research & Development Center (CRD) ' the same groups that were responsible for breakthroughs ranging from the introduction of the first practical rotating-anode x-ray tube to the development of the first five-second CT scanner. CRD has had more than 100 researchers working on digital x-ray imaging for nearly a decade. The measure of the combined effect of detector noise and contrast performance, Detective Quantum Efficiency (DQE) is widely recognized in the scientific imaging community as the most accurate gauge of image quality ' a gauge that incorporates most traditional image-quality measures, including signal-to-noise ratios and spatial frequency. And GE digital detectors deliver higher DQE than state-of-the-art film/screen, computed radiography and current flat-panel Selenium-based digital imaging systems, especially at the low-to-mid spatial frequencies where most clinically relevant information resides. The reason? A combination of the right materials and the right design, which work together to optimize all the components of DQE ' including Cesium Iodide's very high x-ray absorption and very low-noise panel electronics to capitalize on all available x-ray signal. In addition, GE has chosen a single-piece, flat-panel design. Although this design required intensive R&D and manufacturing efforts that only a company with the resources of GE can contribute, it is worth it; this single-piece design eliminates the potential for misregistration or stitching artifacts that could plague alternative approaches (see next section: Alternative Digital X-ray technologies). The result is increased object detectability for virtually any clinical application. High productivity is obviously the key to successful digital x-ray imaging. And it's a goal that dictated many of GE most important and fundamental design decisions. For example, for the detector itself, GE chose a wide latitude and optimized matrix size to help ensure optimal image quality without engendering impractical transmission times. For the overall system, GE incorporated such productivity-enhancing capabilities as autotracking tube stands and Automatic Optimization of Parameters (AOP), both of which speed exam set-up. To reap the rewards of advanced connectivity, the major emphasis was placed on ensuring full, DICOM 3.0 integration with other high-productivity information systems such as HIS/RIS, PACS, LANs and WANS...and then further streamlined the imaging process by incorporating capabilities such as patient-worklist integration. And to help ensure maximum return on your investment, GE added a complete range of Business Solutions initiatives to the equation ' including process re-engineering and environmental analysis. As a product of GE Six Sigma program, the GE digital detectors feature an inherently reliable design ' largely because of the single-piece flat-panel approach, which eliminates the panel-to-panel seams that can introduce both mechanical and reliability issues. The choice of Cesium Iodide scintillator technology was key, too. Unlike the other materials being proposed for digital detectors, Cesium Iodide is a mature and well-understood technology offering 25 years of proven reliability. That translates into minimized risk, maximum quality. In fact, over the last ten years all the alternatives have been evaluated; Cesium Iodide remained clearly the proven choice to meet such strict requirements. Furthermore, GE dedicated manufacturing facility is fully automated, and fully equipped to perform all detector-manufacturing operations in a single location. That means that GE can ensure consistent, start-to-finish application of stringent quality standards, as well as the single-source, system-wide responsibility that will be so important to high-through-put departments. It also means that GE can guarantee a future supply of detectors. By including such characteristics as fast acquisition and low noise into GE digital-detector design from the start, GE has laid the foundation for potential access to a large range of future advanced applications ' including computer-aided detection (CAD), tomosynthesis, digital-subtraction angiography, dual-energy imaging and low-dose fluoro positioning. While we can't predict which of these applications have the greatest potential for becoming clinical realities in the years to come, it's clear that some will; and GE digital-detector systems will be prepared to accommodate them all. GE digital-detector design will be easily adaptable to all x-ray imaging modalities ' not just the chest, mammography and Cardiology systems that are the first to harness its power, but also everything from R&F to vascular-imaging systems. And that has two important implications for our customers. First, it allows GE to offer premium technology at a very competitive price; there's no need to start over again for every application, because our detector design can be easily optimized for each one. Second, it means a common platform across applications ' which in turn translates into simplified cross-training of the technologists and other support personnel who are so critical to departmental performance. This approach involves acquiring several "lines" of information as detectors are swept over the anatomy of interest. Although it can potentially yield relatively high resolution, it requires very precise synchronization of electronics and mechanics in order to avoid misregistration artifacts and blurring. It may also result in slow acquisition speeds. This transitional technology employs multiple CCDs coupled to a scintillator plate via fiber optics. Because it could potentially take as many as 12 CCDs to create a clinically adequate FOV, the potential disadvantages include stitching artifacts, intensive image-processing time to form the digital image, and typically a very high detector cost. This technique employs flat-panel Selenium detectors, which absorb x-rays directly and convert them into electrical charges at individual pixels. The charges are then read by read-out electronics and turned into digital data. 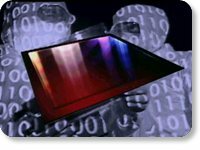 The potential drawbacks include reliability issues and typically lower DQE, which not only degrades image quality but also limits access to advanced applications. Already in use for radiographic imaging, this method involves trapping electrons on photostimulated plates and then exposing them to generate image data. Although this technique offers a wider dynamic range than conventional film/screen methods, it is sometimes used with a higher dose than conventional film because of its relatively low DQE. Nevertheless, over the next few years there will clearly be a need for CR for such applications as bedside imaging, since the industry is some years away from making this technology affordable enough for mobile application. Developing the right digital-detector technology requires an enormous investment on the part of a manufacturer. At GE, for instance, we've devoted more than 11 years and $130 million to this effort. Yet we believe it's important to approach this massive change in x-ray technology in a phased roll-out, taking it a step at a time to demonstrate its efficacy for each application, and carefully honing its performance at each stage of its evolution. Here are the applications that are the first to benefit from this comprehensive approach to digital x-ray's future. 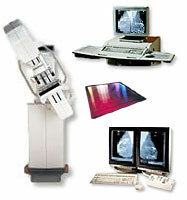 Senographe 2000D is the new Digital Mammography System from GE Medical Systems. It changes breast care forever with new efficiencies for physicians and peace of mind to patients through its speed, and reliable electronic information. This system has been designed to perform screening exams as well as diagnostic views. It is a complete, modular system that eliminates the need for film cassettes and takes full advantage of digital technology from on-screen image display to Networking, Filming and Archiving. The digital radiography systems from GE are designed to meet your clinical requirements today and to address the trends that will make digital x-ray a logical imperative over the next decade. The Innova 2000 turns the promising potential of all-digital / cardiovascular imaging into reality - with such outstanding image quality that cardiologists tell us they are seeing things like they've never seen them before.